[there is] a tension between two conflicting claims about action mirroring implied by the direct-matching hypothesis: the claim that action mirroring reflects low-level resonance mechanisms, and the claim that it reflects high-level action understanding. The tension arises from the fact that the more it seems that mirroring is nothing else but faithful duplication of observed actions, the less evidence it provides for action understanding; and the more mirroring represents high-level interpretation of the observed actions, the less evidence it provides that this interpretation is generated by low-level motor duplication. In order to activate the neurons in the hidden condition, two requirements need to be met: the monkey must “know” that there is an object behind the occluder and must see the hand of the experimenter disappearing behind the occluder. It appears therefore that the mirror neurons responsive in the hidden condition are able to generate a motor representation of an observed action, not only when the monkey sees that action, but also when it knows its outcome without seeing its most crucial part (i.e., hand-object interaction). But if the monkey already knows the outcome, what is the point of simulating it with a motor response? Note that the action, the movement itself, is the same in both cases. What causes the mirror neurons to fire, then, is not the movement, but the presence or absence of the object (in the monkey's memory). It is not a simple resonance. 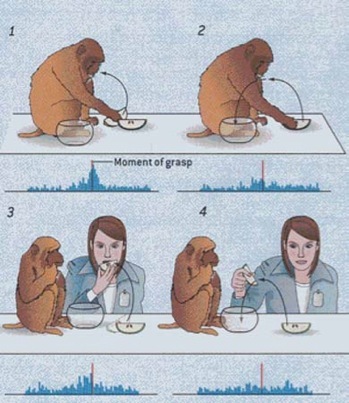 The figure shows the response of a grasping-to-eat mirror neuron responding both when the monkey performs the action (1) and when he observes the action (2). Notice, though, the the point in time when the cell starts firing during observation: it is during the reach toward the object, prior to the grasp (the red line=moment of grasp). This is puzzling because the reach toward the object is identical in both conditions. Only the subsequent movement, bringing to mouth or placing in container, distinguishes the action. How could the mirror neuron know ahead of time? Is it mystically reading the mind of the experimenter? Not at all. The container was present only in the trials in which the grasped object was subsequently placed into it. The presence of the container acted as a cue allowing the monkey to predict the most likely subsequent motor act. It was the visual context that told the monkey ahead of time what was going to happen. So again like the occlusion study, what determines mirror neuron activity is not the action itself but the monkey's broader understanding of the action context. Monkeys do not understanding because their motor system resonates with observed actions. The motor system resonates with observed actions because the monkey understands already what's going to happen. Csibra, G. (2007). Action mirroring and action understanding: An alternative account. In P. Haggard, Y. Rosetti & M. Kawato (Eds. ), Sensorimotor foundations of higher cognition. Attention and Performance XII (pp. 453-459). Oxford: Oxford University Press. Fogassi, L., Ferrari, P. F., Gesierich, B., Rozzi, S., Chersi, F., & Rizzolatti, G. (2005). Parietal lobe: from action organization to intention understanding. Science, 308(5722), 662-667. Umiltà, M., Kohler, E., Gallese, V., Fogassi, L., Fadiga, L., Keysers, C., & Rizzolatti, G. (2001). I know what you are doing. a neurophysiological study. Neuron, 31, 155-165. The Department of Communication Sciences and Disorders (CSD), College of Health and Human Development (HHD), at The Pennsylvania State University, invites applications for the position of Department Head to begin Fall 2015. Penn State seeks an innovative and energetic leader to build upon the existing strengths of this nationally and internationally acclaimed department. The Department Head is expected to be a leader who promotes excellence in the full range of missions that are embodied at a comprehensive, land-grant and research intensive university such as Penn State. As a key academic leader, and in keeping with the strategic initiatives of the University and the College, the Department Head must have the ability to stimulate and facilitate research productivity, encourage interdisciplinary research, and promote and assist faculty with securing external funds to fulfill the mission of the department. The Department Head must also expand upon the current strengths of the faculty by identifying and facilitating new opportunities in undergraduate, graduate, and on-line education. Qualifications: Earned doctorate; evidence of an active, focused program of research in speech, language, or hearing, or a related field; previous college teaching and administrative experience; and be eligible for appointment as a full tenured professor at The Pennsylvania State University. CCC-SLP or CCC-A certification is preferred. Significant leadership experience in a university setting, including coordination and fiscal management of department programs, is highly desirable. Candidates should be prepared to provide contact information (name, address, phone number and email address) for three professional references upon request. References will not be contacted without the consent of the candidate. Direct questions to: Kathryn Drager, Ph.D., CCC-SLP, CSD Search Committee Chair, Interim Associate Dean for Research and Graduate Education, College of Health and Human Development, University Park, PA 16802-1307, 814-863-2426, or kdd5@psu.edu. Please indicate CSD Department Head Search in the subject line of email correspondence. All inquiries will be held in confidence and all applications will be held in confidence until finalists are invited to the University Park campus. We encourage applications from individuals of diverse backgrounds. We are supportive of dual career situations. Josef Rauschecker has a new paper out in Frontiers titled, "Is there a tape recorder in your head? How the brain stores and retrieves melodies." It's worth a look. The problem of coding sequences of information is an important, and poorly understood one. The dorsal stream was originally defined by its involvement in auditory spatial processing (Rauschecker and Tian, 2000) and movement in space (Warren et al., 2002). This is still believed to be correct (Rauschecker, 2012), but the role of the dorsal stream has been expanded to include sensorimotor integration and control in more general terms (Rauschecker and Scott, 2009; Rauschecker, 2011), including the representation of sequences. As I pointed out in this post, the idea of dual streams in auditory processing pre-date Rauschecker and Tian by at least a half a century, and can trace their route back even farther to Carl Wernicke who argued for the existence of two auditory pathways, one that projects to the motor system and on that projects to the conceptual system. Secondly, the idea that the dorsal auditory stream processes spatial information has been questioned and re-questioned by the likes of Robert Zatorre, John Middlebrooks, as well as by work in my own lab headed by former grad student Kevin Smith. A discussion of why, from a purely conceptual standpoint, "spatial processing" cannot possibly be a "stream" can be found in this review by Hickok & Saberi. To summarize our point, streams are organized around computational tasks (what you do with information) not around information types. So "This is still believed to be correct" is better stated as, "This is still believed to be correct, by Rauschecker." Good to see, though, that Rauschecker has correctly acknowledged the "expansion" of the role of the dorsal stream to include sensorimotor integration. I'm sure his omission of Hickok & Poeppel, 2000, 2004, 2007, Wise et al. 2001, Buchsbaum et al. 2001, Hickok et al. 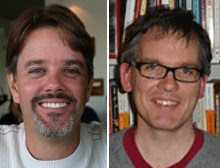 2003, 2009, 2011, Pa & Hickok, 2008, Isenberg et al. 2012, to name few, was a merely a proofing error. Middlebrooks, J. C. (2002). Auditory space processing: here, there or everywhere? Nat Neurosci, 5(9), 824-826. Pa, J., & Hickok, G. (2008). A parietal-temporal sensory-motor integration area for the human vocal tract: Evidence from an fMRI study of skilled musicians. Neuropsychologia, 46, 362-368. Smith, K. R., Okada, K., Saberi, K., & Hickok, G. (2004). Human cortical motion areas are not motion selective. Neuroreport, 9, 1523-1526. Smith, K. R., Saberi, K., & Hickok, G. (2007). An event-related fMRI study of auditory motion perception: no evidence for a specialized cortical system. Brain Res, 1150, 94-99. Zatorre, R. J., Bouffard, M., Ahad, P., & Belin, P. (2002). Where is 'where' in the human auditory cortex? Nat Neurosci, 5(9), 905-909. PHYSICISTS: We have determined that Oppenheimer and his team have succeeded in building a nuclear weapon. All we need to do is simulate what they did. HEAD-OF-STATE: Great! So how did they do it? PHYSICISTS: We don’t know. But simulating their methods will definitely work. MIRROR NEURON THEORISTS: We have determined that when we carry out an action of our own we understand the meaning of that action. When we observe someone else’s action, all we need to do is simulate that action in our own motor system and we will achieve understanding. SKEPTIC: Yes, but how do we understand the meaning of our own actions in the first place? MIRROR NEURON THEORISTS: We don’t know, but we know that simulating that process will work.